Recently, the Maldives began construction on an ambitious bridge to link the capital Male’ to the neighbouring airport island, Hulhule’. As a result, the Maldives Victory, arguably the country’s most famous wreck, has temporarily been designated as out of bounds due to its close proximity to the construction site. In the meantime, where to dive to catch a glimpse of sunken treasure? 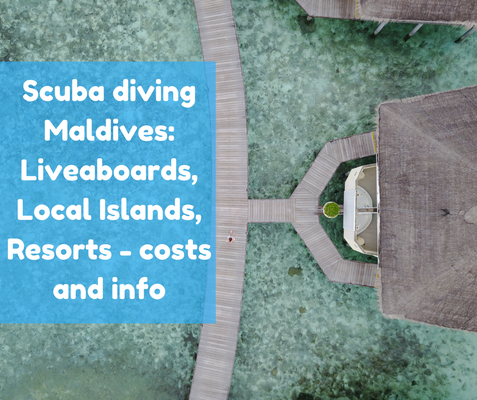 Adele Verdier-Ali from Fulidhoo Dive tells us more. Built in Newcastle in 1928, this 140m-long oil tanker was twice torpedoed during World War II. First in Madagascar by a Japanese midget submarine in May 1942 and again by a German U-183 on March 9th 1944, after she had been moved to Addu Atoll to serve as a storage vessel. Neither attack sank the vessel and she remained in Addu for the rest of the war. She was finally sunk on January 5th 1946 when the British towed the ship to her present location and fired on her from a British warship, causing oil to leak from the vessel for many years. The ship now rests on her starboard side, with the port side at 16m. Dense hard and soft corals now grow all over the ship, including on the propeller which sits at 28m. Divers can also swim through the large hole made by the torpedo to explore the ship’s interior. The site harkens back to an incredibly interesting point in Maldivian history and is a must for those interested in the British presence in the country. 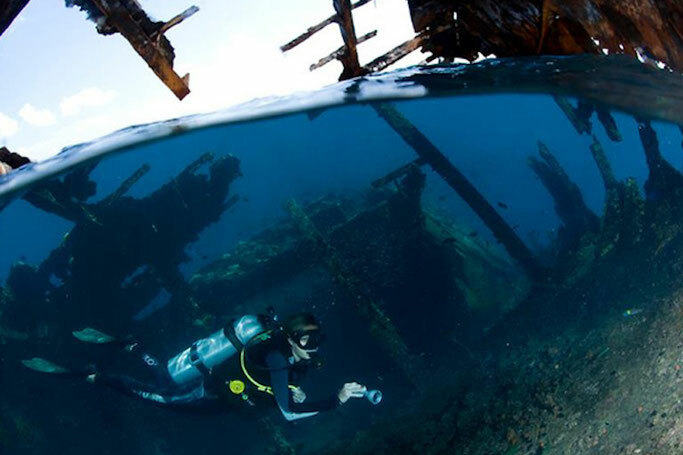 With the bow of the Skipjack II protruding high out of the water, this dive site is instantly recognisable. Before becoming the atoll’s most remarkable water feature, the vessel was used by the Felivaru fish factory for many years, being permanently moored to the island’s jetty. In 1985, when the factory decided that the vessel no longer served them, it was agreed to scupper her at sea, deep in the channel. However, on the day she was to be sunk, on the way to the decided location, the ship caught fire and was cut loose for fear of a chemical explosion. Water flooded the vessel and she began to sink stern first. The bow reportedly continued to burn for almost a month. Another vessel was soon scuttled in the same location, and although initially also in an upright position, this ship now lies 40m away from the Skipjack II, lying on her port side at 28m. Both vessels are now home to many soft and hard corals and an abundance of reef fish. Strong currents can sometimes make diving here difficult, but in the right conditions this site provides outstanding diving for both beginners and advanced divers alike. To the west of Dhigufinolhu island lies a small, submerged patch of coral known locally as a giri, (kuda meaning small in Dhivehi). On its south-west side lies a wreck of a steel fishing trawler, which has been lying on the sandy bottom at 35m for more than a decade. The vessel lies upright with its bow pointing towards the reef at about 18m. The deck slopes down towards the stern, which is at about 30m. Both soft and hard corals adorn the outside of the vessel, and divers can find a resident school of batfish, glassfish, wrasses and jackfish. There’s also a chance to spot frog and leaf fish here, as well as on the reef itself, which is extremely pretty and well worth exploring after the wreck. A great spot for night diving, too. This steel, Japanese cargo vessel, sometimes also simply known as Machchafushi Wreck, was sunk especially for divers in 1998. Since then the vessel has been inundated with life – both soft and hard corals compete with sponges, algae and sea squirts for space on this 30m ship, making this a fantastic spot for observing and photographing macro life. In addition to a profusion of critters, divers can find large lionfish, boxfish and pufferfish around the vessel. Those who wish to explore the interior can easily do so from access points on either side of the hull. In 1879, the SS Sea Gull, a 1012 tonne steamship, was travelling from London to Calcutta when she ran aground outside Gaafaru. Today, the anchor sits on the reef at one metre and can be spotted at low tide. The rest of the ship split in two and other pieces are scattered across the reef, such as the two-cylinder engine. Due to the length of time in the water, the wreckage parts are almost entirely covered in coral, which at times makes them easy to miss. There is also a cave at 30m, where it’s possible to spot nurse sharks. 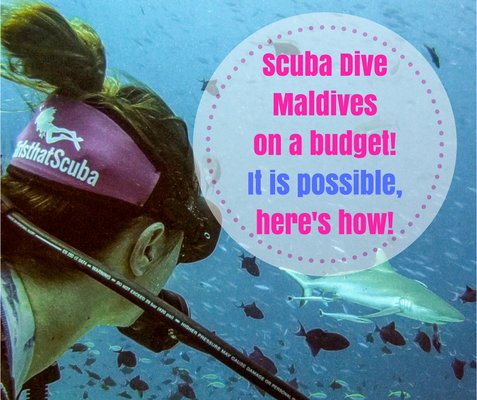 Elsewhere, divers can often see barracudas, jacks, eels and stingrays. Before she ran aground on the north west side of Gaafaru on April 16th 1974, the Lady Christine had been conducting survey work and laying communications cables. When stormy weather meant that a tugboat was unable to pull her from the reef local workers were frantically called upon to rescue all valuables from the ship as she began filling with water. The ship owners eventually resorted to blasting holes in the reef to create a channel as a last-ditch attempt to save the ship, but all efforts proved ineffectual. When all salvage attempts were wrapped up, the vessel was abandoned. The ship now sits about 300m west of Hulhangu Kandu, with the bow visible above the surface. Most of the wreck lies scattered on the reef above ten metres and an incredible variety of marine life can be found in the vicinity – fish, eels, rays, sharks and turtles. There are also some beautiful caves at 30m, which many divers explore first, before making their way to the wreck for the remainder of the dive. The Corbin, a French ship which ran aground on the reef of Goidhoo Island in 1602, is best known in the Maldives for being the vessel that brought French sailor and memoirist François Pyrard de Laval to the country. A survivor of the wreck, Pyrard was held in captivity in the Maldives for five years, only managing to leave when a band of marauders from India helped him escape. He then went on to publish an account of his time in the country and the journal provides one of the richest historical insights into the Maldives’ past. Although nothing remains of the vessel, the site still prompts intrigue, especially amongst those who know that the vessel’s cargo of many thousands of silver coins is still scattered across the ocean floor, waiting to be retrieved. Maamakunudhoo Atoll, which is administratively part of Haa Alif Atoll in the far north of the country, has seen many ships scuttled on her reefs over the centuries. Sticking out to the far west of Haa Alif, Maamakunudhoo stands alone with only one inhabited island, and her isolation has often caused its reef to go undetected by passing ships. The most famous of these was the Persia Merchant, which sank in 1658 en route from England to Bengal. Many were drowned and salvage of the eight chests of gold and silver on board was unsuccessful. 50 survivors were for a while stuck on an uninhabited island in the southern part of the atoll, where they found a well with drinking water. The island today is called Fenboahhuraa, meaning ‘Drinking Water Island’. They were later given a vessel in which they sailed to Sri Lanka but the precious cargo remains in the ocean to this day.